While you were exploring the mysteries of raging hormones, sneaking cigarettes and wine coolers, I was busy learning Robert’s Rules of Orders in the Model United Nations. It was an after-school club. We’d be assigned countries and bone up on their policies, using any research materials we could dig up in that pre-Internet world. (Facts on File was a good one.) And then we’d meet at conferences with kids from other schools and hash out resolutions on the international topics of the day. There were local conferences (we hosted one at our high school), regional ones (I’ll never forget you, Monmouth College, and your Rundle toilets), and the big daddies at the University of Pennsylvania and Georgetown (the North American Invitational!). We’d stay in hotels and wear ties and it was a total blast. Upperclassmen got to pick the best countries. 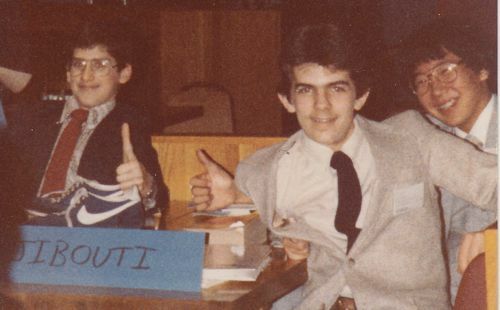 Freshman year, my buddies Amit, Steve, and I were stuck as the Djibouti delegation. 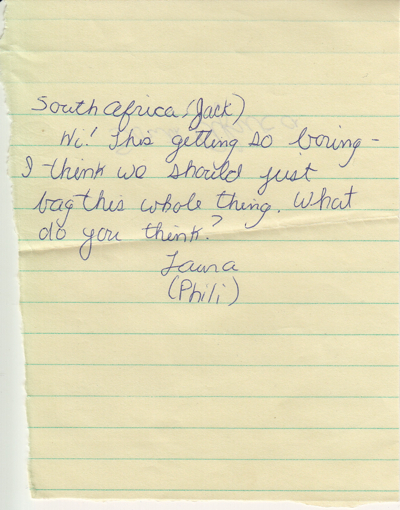 Within a couple of years, though, I’d moved up to South Africa, scourge of the free world in those days. And we took our role-playing very seriously: drafting resolutions, making speeches, finding allies before a vote. You could communicate with other countries via a high-tech note-passing system. (I believe volunteer staff would deliver the notes.) 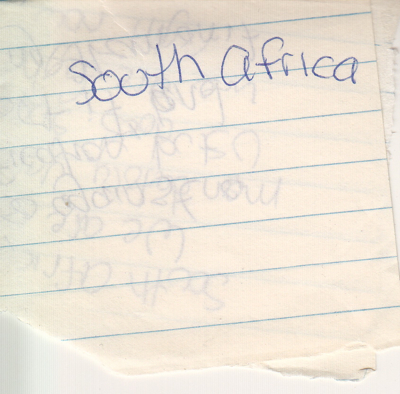 You’d receive a folded-up piece of paper with your country’s name on it. Inside would be a question or comment regarding the resolution at hand. But, we were teenagers after all, and I was quite the charming S.O.B. 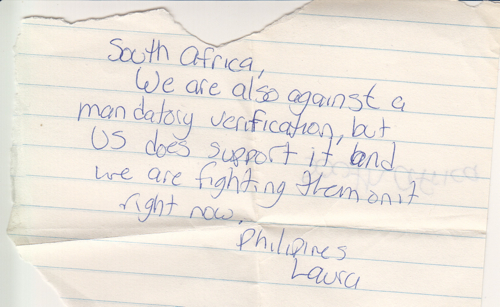 So Laura of the Philippines soon stepped up her game. Two notes, two spellings of Philippines. Also, the handwriting is different. Did a friend write this for her? (This is all hindsight; we didn’t have CSI back then.) I’m sure I scanned the room for a glimpse of Laura. Check out that smiley face, long before we knew what an emoticon was. 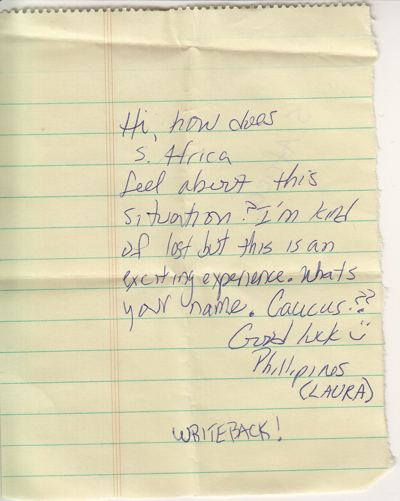 And I must’ve found the suggestion to “caucus” absolutely titillating. And then dropped the pretense of attending a conference. Now, more than a quarter-century later, I still find that to be a very arousing note. Teenagers in a different city with hotel keys and roommates stuck in sessions—the possibilities were mind-boggling. But, I’ve always been a good boy, not to mention… a complete and utter coward. I know I didn’t sneak off with her. I wonder what I wrote back. Whatever it was, she didn’t give up on me. She was psyched! Three question marks!!! I must’ve spent those two hours with her, right? And yet I don’t think I did. That would’ve been pretty major for me, and I have no recollection of it. What the hell? I guess I didn’t break her heart, as I have two notes presumably from the next day (in different ink, anyway) saying, “Hi! What’s new?” and “Good speech!” Was I not attracted to her? Was it just that I clearly took M.U.N. much more seriously than her? Or, like so many times before and so many since, was I just a big stupid chicken? 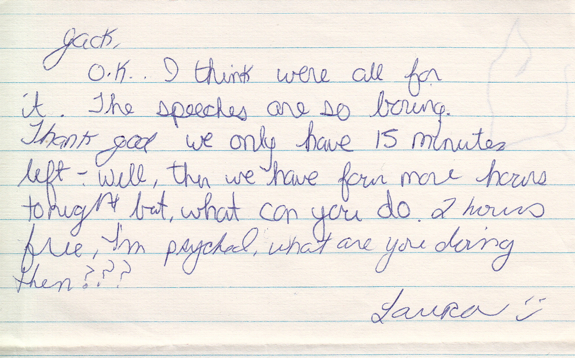 Whatever my excuses were, they can be summed up by the only non-Laura note I saved from the conference. I love that you saved all this stuff. I still have notes from friends from 7th grade. I should get rid of them, but I can’t. Hilarious! Oh, Laura, where are you now? In the Philipines [sic]? Thank you, Caren, thank you, Jenny! Yes, I like to think she’s employed by Imelda Marcos, perhaps as a shoe alphabetizer. This has the makings of a book…or at least some flash fiction. No pun intended. Seriously, though, these missives prove yet again why you are such a swell guy. Laura, you were one lucky delegate!